All transactions are safe and secure with a reliable history in online purchasing behind each of our associates. 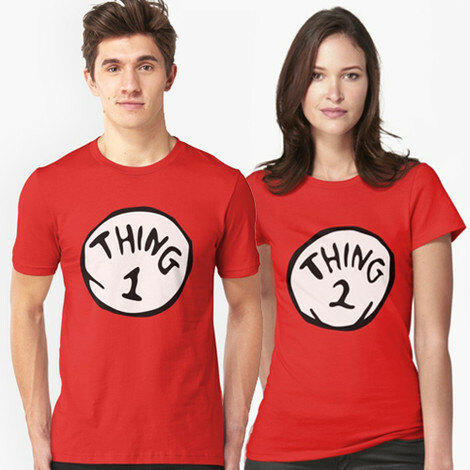 Buy the Thing 1 and Thing 2 t-shirts to own Dr. Seuss clothing and merchandise. How do you do? Would you like to shake hands with Thing 1 and Thing 2? If this sounds like one of your wildest dreams come true, then these Thing 1 and 2 shirts for adults are for you. Keep your eye on them though. They are known for their bad tricks like flying kites in the house and bumping them off all the walls and lights. Whether you wear them to remind you of your favorite childhood characters, or top yourself off with a blue wig for a humorous Dr. Seuss costume for adults, these tees are sure to get some attention. If you have a friend who wants in on the action, check out The Cat in the Hat costume below. In addition to the Thing 1 and Thing 2 tees above, browse the Dr. Seuss Clothing Gallery for more apparel like men's and women's clothes, kids shirts or hoodies.